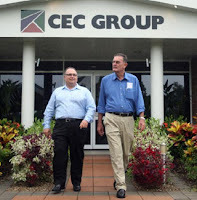 Last week in a closed meeting, Cairns Regional Council agreed to pay $400,000 to property developer CEC Group, under the guise of a "refund," regarding advance 'headwork' payments concerning four development lots in the Mount Peter area. Only Councillors Julia Leu, Kirsten Lesina and Robert Pyne opposed returning the money. The massive amount will be repaid to CEC, but was only discussed under a "commercial in confidence" agreement. Most developers make an advance payment for 'headworks' like draining, roading, sewage and pathway infrastructure. The original payment of $492,000 was for long-term planning and infrastructure for the new Mount Peter township development near Edmonton. Some senior staff who spoke off the record to CairnsBlog said the contribution was returned probably due to the precarious financial position of CEC over recent times. "Yes, that's my understanding, I think they asked Council nicely," the staffer said. Returning a developer's contribution for master planning sets a dangerous precedent. Shouldn't all developers be treated the same? Will others want their contributions returns, or portion of it, when they learn of how CEC has been treated? If ratepayers applied the same deal, it would be an interesting scenario. Of course some people can pay their Council rates easily, and some others can't. If some are having a rough trot, does Council simply say, "don't worry about paying all of your rates this year"? Council has agreed to retain $97,760 for one separate lot in the Mt Peter project, which is a large scale master-planned community. Its believed that because this may be some time off, CEC put forward a case for the return of their contribution until particular parts of the project commence. Such contributions go into a special fund to plan new subdivisions. It's unclear if any refunds have been made in the past of this nature, however staff talked to could not recall that this has happened before. "It would happen say if the development failed to go ahead altogether, however that is not the case with Mt Peter," the staffer told CairnsBlog. Most Councillors would not discuss the payment, citing the debate was held in a closed meeting. You say:"Only Councillors Julia Leu and Robert Pyne opposed returning the money." Doesn't your leaked extract of the Minutes show that Cr Lesina voted against it too? You're right Mick. I have amended. That's what happened when you write in the dead on night. Did Council pay for a collection of smackaroons worth a combined $395,000, or did they purchase something from CEC for 395,000 smackaroons? Or was it, more correctly, 395,000 smackaroos? Is a smackaroon some type of sweet biscuit? How can you expect anyone to take you seriously when you can't spell, construct proper sentences or even bother to check your work? If you can't be bothered to check the spelling of a simple colloquialism how can we believe you've checked the authenticity of your so-called "exclusives"? I dont think it is such a big deal... If the development goes ahead that money should be paid back to the CRC, but if the proposal has been shelved and it will help keep a local employer employing... whats the biggy... it is not RATES money or savings.